Home › Reviews › Is THWGlobal A Scam? What is THWGlobal? Is THWGlobal a scam? In my review of THWGlobal, I will help to get a grasp on whether or not this company is legit or a scam. The THW stands for “Ten Hours Weekly Global” This is at the time of writing this, a very new company wanting to launch this very day of July 4, 2016. They claim, that they don’t want to be bigger than YouTube, but they claim they want to be the worlds largest advertising giants. Well fee-fi-fo-fum, I can appreciate their lofty and ambitious goals. I would also gather from their comment that they are probably going to be having video content within their site. You can check out my other page on THWGlobal for more information at What is THWGlobal? I will post updates there more than here. The real kicker to this company claims is that you could be making UP TO $25.00 an hour by watching videos. See the video below. Also, I will post updates under the Update header below or at my other page What is THWGlobal? Searching or Simply Shopping online for everyday items. Having referrals under you, people you get to join. The ability to sell ads at THWGlobal through their Certified IV program. How is THWGlobal going to pay people? Well, they look like they are going the token to points to cash route. Tokens are exchanged for points. 100 points equals $1.00 USD. Points Can be directly converted to gift cards or PayPal or Payza or request a check. I signed up and filled out a quick general survey, once I joined. The sign up was easy and did I mention it was free also. You do not have to enter any credit card information or any bank information either. As time goes by, I will update the information as I acquire it about THWGlobal. As they have yet to launch their site into full swing. I can recommend signing up because there is no credit card information or banking information required. Just your name and email address. Make up to $25.00 per hour watching videos. The videos are “Better Than YouTube Type Videos”. A maximum of $250 Weekly. Also, huge management 6 figure opportunity (huh?) Where does one apply for this, it’s never stated. It’s YouTube in reverse. They pay the viewers instead of paying the content creators. No Fees or gimmicks (Yet, to be determined) I haven’t seen any fees for the free IVs. You receive $5.00 for every person who earns up to $25.00 an hour that you personally referred. (The wording on this is jinky.) Then they later state, “you will be rewarded for doing so by receiving $5 for every $25 they earn. I left after reading this feeling confused. I think the last statement is the one to go on. Easy sign-up. No credit card or banking information. Must be 18 years of age to join. Watch up to 10 hours weekly of videos and supply comments. Smartphone or computer with internet connection. Key points to remember, their wording. For example. “earn up to $25 an hour”. You have the potential to get $25 an hour but how likely is this. This is yet to determine, but like most places they oversell you the hype. Most people will not earn $25 an hour is my guess but it might be possible. I just want you to be aware of the, “earn up to” part. You can read more about it here. I will post updates here and on my other page What is THWGlobal? So, remember to check out both. 08/08/2016 Another update here, as THWGlobal has officially launched their beta versions of the video platform. They have video to watch online and it is up and running, but don’t expect to get paid yet from watching them. They are only for viewing now. 7/20/2016 Just receive an email from THWGlobal that I thought I would share with you. In the letter, they state that they set up a new e-mail to answer questions. Apparently, the will respond to questions. They also tell in the email they are getting closer to getting started. They also post an address which I will share. “WE ARE HERE TO SERVE YOU! Think about the possibilities. The power of just 2 by 10 levels = 1024 referrals x’s up to $10 per week could pay a lot of money weekly. So, if your thinking about joining, you also need to think of using this platform to its maximum. By getting people to sign up below you. Through email, Facebook or any other social media. If this company is legit, you need to have people under you, even 1 active person is going to be helping you earn more money. You spend 10 hours a week watching BetterThanYouTube videos you would earn up to $1,000 a month! You find 10 others to do the same and you would earn up to $2000 a month + your $1,000 a month! You build a 10 level team of thousands or more to do the same you would earn up to $40 Monthly for each person within ten levels!0.00 a month. Anyone in the world available to join, as long as your 18 years of age. They need people from every race and language. The potential to maybe earn up to $25.00 an hour watching videos. Possibly being paid up to $5.00 for each person you sponsor for each hour they spend watching (there it is again) BetterThanYouTube Type Videos. Up to $25.00. A referral program. Their referral program looks very good. If you feel like joining, despite it being a new company and want to support my site, please click Join THWGlobal. Video platform up and running for countries with enough IVs. Seems like a decent video platform. Ability to track viewing history. With columns for Watched by, Description, Video Length, Time Watched, Ads Served, Ads Viewed, Comments Added. Apparently, THWGlobal is going to be crediting people for the length of additional time as well as the video time and even back crediting you for the ads you have already watched. Nice gesture. Screenshot of Your Viewing History at Thwglobal. Need to be over the age of 18 to join. Taking surveys was added to the list of ways to earn at THWGlobal. While, some people like survey taking, I personally dread it. I feel like I’m wasting my life when doing surveys. Just my opinion and I respect people that like doing surveys. It’s just not for me. Being contradictory first they claim you need only be 18 years of age, then later, down two paragraphs they say, “As long as they are over 21 with an HS Diploma…”. Well which is it?, I’m confused. I don’t know what is “BetterThanYouTube” type videos are. Do you know? **UPDATE** These videos are no better than YouTube videos. No Transparency, we know nothing of who owns this site, which can be a real red flag for possibly being a scam. Most legit companies have an about us page in which they share who they are and their purpose and agenda. Not here. THWGloabal requires you to watch 10 hours of video for free initially. THWGloabal then takes down the longer videos on their platform, so they edit their videos due to length, to make you watch more videos and more adds, which equates to more of your time. I can’t find these longer videos anymore. They first stopped giving credit for watching the longer videos, now they just removed them from the site. People are naturally going to find an easier route to do anything. Instead of clicking on 2-minute video they’ll find a 41-minute video to click on. But it’s getting harder and harder to find longer videos. Comments on video need to a minimum of 80 characters long. Why? A relevant comment can come in any size. Comments should be organic, not forced and having a minimum length is making people type gibberish or complete nonsense. Sorry, I can’t write an 80 character comment on a 54-second video. Must watch a video to completion in order to comment on video, that means the ads too. Watching videos the front load and back load ads. They get you twice for one video. Very annoying little blue monster that pops up when their site breaks down. Why is he annoying because he makes a chirping noise constantly. It is really horrible. Thankfully, this doesn’t show up very often. Just thought I be helpful and give you some of the lengthier videos I’ve come across since most of the videos available are between 1 or 2 minutes long. Some Longer videos to get your initial 10 hours. Just copy and paste inside THWGlobal search. Hope this helps, if you know of any please comment below and I will post here. It seems THWGlobal is taking down the longer videos on their platform. How To Get Referrals At THWGlobal? I have a few suggestions to get referrals under you to increase your earning potential at THWGlobal, as I have been asked a couple of times about this. When you sign up for THWGlobal, if you need to join you can Join THWGlobal Here, they give you three referral websites which you can promote, through email, website, videos, or word of mouth. This is a great way to increase the possible way to earn more income and should be taken advantage of. Create a video on YouTube – promoting, reviewing, this company. A great free screen capture program is Screencast o matic to create your video. Create a website – promoting, reviewing THWGlobal. You can get two free websites here. My number #1 recommend program for making money online deals with creating and building a website and making money with websites. This is the best place to learn affiliate marketing online. It’s my number #1 for a good reason. I don’t recommend that you recommend this to family and friends since THWGlobal is unproven at making anyone money as of right now. But maybe if you explain all of the uncertainty of this new company, then let them make the decision on their own. Problems Viewing Videos At THWGlobal? I am getting a lot of question about people not able to view videos at THWGlobal and what they should do about it. I’ll try to help here. First, sign up to THWGlobal. Second, If you have Google Chrome browser use that to access, if not download Chrome then proceed to http://www.thwglobal.com/VideoCenter/RecentlyAdded This is where the video are available to watch. Third, it is possible that region of the world doesn’t have enough IV and when your region has enough IV you will be able to view videos. I will post from FAQ on THWGlobal below. Fourth, You don’t have at least 10 people registered under you. This is free, btw. Fifth, The video is powered by flash and you might get a pop up asking you to allow this. If you want to allow this click Yes and remember. Also, your flash player might be in need of an update. Q: When will we be able to begin viewing content and ads? A: Advertising will begin when there is a minimum of 50,000 IVs in a given geographic territory. You need ten hours of initial viewing of videos to be qualified to be paid, later when THWGlobal is fully running on all legs. So, your initial ten hours is free, you won’t be paid for this initial 10 hours, it’s on the house. Find the longer videos to watch and do something else while it is running in the background. But also comment occasionally and rating videos and clicking on advertisers. They now have sharing capabilities for sharing their videos. Either through email, Facebook or Twitter. So, when your shared video is watched you earn credit for it. Once, the site is up and running, All IVs must watch a minimum of 5 hours videos or activity. This is waived for the Certified IVs, who have paid to be certified. Also, If you are getting an error message when you try to watch videos that is because your country is not turned on yet. However, you can still review all the offers in your back office and around the videos for your 10-hour initiation. THWGlobal has two IVs. One is the Free IV and the other is Certified IV. Free IV is of course free. You are required to initial watch 10 hours of videos for no compensation, once the program is up and running required to watch a minimum of 5 hours of activity in order to qualify for commission on people below you. Certified IV cost $495.00 plus $39.95 a month to join. This is currently their reduced price, the regular price is $995.00 plus $39.95 a month. What do you get? Online Sales Training, continuing sales motivational and technical training and education. Also, you will have the ability to promote and sell advertising on the THWGlobal Video platform. A ton of money to hand over for an uncertain company that is just starting out. No required hours of activity to be paid. FREE IVs can earn a maximum of up to 1,000 reward dollars a month for personal effort and a maximum of up to 10,000 reward dollars a month for 10 Level Team building effort. Including all POWER LEG and Dual Team BONUSES! FREE IVs need a minimum of 5 hours of surfing weekly to be commission qualified. Failure to have 5 personal hours of viewing and/or reviewing back office offers forfeits all commissions for that week. Paid Certified IVs have no maximum reward dollars for personal or management effort. Paid Certified IVs may sell ads, certification courses and participate in Partnerships. Paid Certified IVs initiation and all minimum video/surfing/reviewing of offers to qualify is 100% waived. Paid Certified IVs may participate in ad commissions, coded and partnership bonuses. Login To Your Back Office and Click On Income Opportunity. Next Click On Certified IV Opportunities. It Will Open Up To An Overview – Read It. Then Click On – Get Certified Now in Bottom Left Corner. Other survey sites pay you to watch videos but come nowhere close to paying what THWGlobal is claiming to pay for watching videos. As of right now, THWGlobal is for adventurous, looking to take minor risks of joining a new and untested company that promises good wages online by simply watching videos and referring people to their site. I want to state again a word of caution here. Be careful of what information you share, as this company is unknown. With that being said, right now it’s worth signing up, as they require no credit card information. It better to sign up early and then see (as long as no real personal information is required) if it is legit and start getting people under you on their referral program. I got one question from someone on signing up at THW Global, that I would like to address when they ask for the “THW Global Website Name” all they are asking is for you to enter a username for their site. So just make up a username or one that you use a lot and enter it in that spot. No training at the time of writing this review. They have an FAQ page with 8 questions and answers as of the moment. Free to join. No money to be paid. Is THWGlobal a scam? To simply tell you I don’t know…yet. I will come back after this program has been running awhile and reevaluate it here and post what I have concluded. That being said, THWGlobal does make some grand statements about making up to $25/hr. by watching videos. Whether or not you can make that kind of money is yet to be seen. Their referral program looks promising and well compensated and might be the winning ticket. It appears to be a like a survey site, in my eyes. But what little information I have to go on it’s just a guess. If you would like to check out THWGlobal despite its newness and unknown creditably, please do so by clicking Join THWGlobal. If in the future if they ask for your credit card number or other sensitive information, run for dem hills, RUN!!!! VERDICT: NOT LEGIT- Supposedly closed due to some violation of Google’s Policies. While things are still up in the air at THWGlobal, I know a proven method of making money online, that is 100% legit. It is my number #1 Recommended way to make money online. So, it is very possible. You can check it out here My #1 Recommend. Read about it. If you have any questions or comments, please feel free to leave a comment below. I would love the opportunity to hear from you. ‹ Is BlogMutt A Scam? Hey thanks Bruce, I know, I’m waiting to see what they have to offer too. Hopefully it’s legit, but like you say it promises a lot. We’ll see. You are really a psychologist. I am just like you thinking what they will do but this is suspective as is it possible to pay as they promise? I am cautionary of this myself. It’s looking more and more like a survey site if you ask me, but the verdict still isn’t quite in yet. I need to spend some time looking at this again but I am busy as of now. Hi Dan, I’m failing to watch their videos. I’m getting a “cannot load M3U8: 403 Status Code”. I notice that we’re quite a number of us experiencing the same problem. They don’t seem to have Support either. How do I get this message to them. Hey Dee, First thing did you try all the steps in my Tips section, under Problems Viewing Videos At THWGlobal? Can you view the video above, about Stranger Things embed in this webpage? It could be bunch of different reasons. #2 Use Goggle’s Chrome browser, this is the browser they recommend. #4 Some countries don’t have enough IVs, so once a country has enough IVs they allow them to view videos for that country. You can help this by actively recruiting people under you, by facebook, email, twitter or whatever. This will possibly help you later too when the site is fully operational as you make percentage of your referrals. #5 Also, If you are getting an error message when you try to watch videos that is because your country is not turned on yet. However you can still review all the offers in your back office and around the videos for your 10 hour initiation. #6 Another tip. The video is played with flash player, your browser might ask you to allow this permission. Click allow and remember to allow this to play. Also, your flash or browser might need updating. Just trying to think of a solution for you. I sent an email on your behalf, I sent the email to this address, whether or not they will reply is up to them. No problem, I hope this helps you. Thanks Yamen, for the additional help. Hello Dan, very good review. Is India included in the program? Also do you know anything about ikradnet.com? Thanks, I spent a lot of time using the platform and researching. Yes, India is in the program and people can sign up from India. I have never heard of ikradnet.com, but will look into it. Is it similar to THWGlobal? Sounds interesting, never heard the term social lending before. Going to have to check it out. You have echoed my thoughts exactly in this post. Although its really still to early to tell whether this is a truly legit option. What is has going for it is that its free and you don’t have to hand over your card or bank details to sign up. I have signed up in anticipation of giving it a thorough investigation once its fully active. Hey Jenny, Yeah I forgot to mention that in my post about it’s free and no credit card or any bank information.thanks for bringing that up and to my attention. I’ll have to amend that. I thought the same thing with nothing to lose to just give it a try. Thanks for stopping by. You did a great job on illustrating this review, I haven’t heard of this myself until now, so I am going to check it when I get the chance.Since they are keeping they are keeping their cards close to their chest on this, I might be hesitant to sign up even though its enticing to make $25.00 per hour, a nice replacement for my day job. Hey Chris, Thanks for the comment. I will be updating the information when it is available. I’m very curious which way THWGlobal will turn. It would be great to have a solid company that can help people out financially. I tried to sign up but i could not do it ,He is giving an error again and again, he is demanding THW GLOBAL WEBSITE NAME nd i don’t know what it means . It is just a user name for the website. So pick anything you like or whatever user name you use on other websites. Hope this helps. Let me know if you need more help, as I will try. Thwglobal does not only look strange it sounds too. Having registered myself & thirteen others as referrals I wish it doesn’t go off-the-hook. Subodh, yeah it would be nice for people if this turn out to be legit, but who knows. It popularity sure shows us how in need people want to earn a decent wage online. But let us remain reserved as this could go either way. 1.We no longer send validation e-mails – check back office for your welcome letter. 2. PayPal along with other reputable pay systems will be used to pay IVs. 3. Many may quit do not despair for each who quit there will be 10 to take their place. THWGlobal will be here for years to come. 4. Ignore the million who will say no. Instead focus on the hundred million who will say yes. 5. There will always be naysayers! Most are just trying to drive traffic off of our internet success. They never erected a statue to a critic. Anyone can tear something down. It takes greatness to build something good that can change the destiny of millions of people for the good. THWGlobal is such a company! THWGlobal Management Has Been In Advertising For 100 Years. Many of You Who Have Registered To Begin Viewing Want To Do It Now! The Bottom Line Is We Have Hundreds/Thousands of Companies Who Will Pay $1.50 and More Per Minute To Advertise To Real IVs Who May Be Interested In Their Products And Services! THE BOTTOM LINE IS: We just do not have the numbers as of yet. With only 230,000 who filled out surveys as of today. “It’s Just Not Enough” It will be up to you leaders to help us get to the enough number. For some cities or areas that number could be as low as 2000 to 5000 people. We are not in the business to have people watch 1 or 10 ads weekly. We need for them to watch hundreds of you tube type videos each being 1 to 3 minutes long. There are an estimated 30 thousand team members who are responsible for the over 600,000 who signed up and the over 200,000 who have taken the survey. We are off to a great start for a company division that did not exist 40 days ago. But you as a team leader need to do your part to get THWGlobal to the numbers we need to make us an advertising phenomenon! You and your loved ones have the most to gain. There are hundreds of businesses that would pay even $1500 to advertise to a 1000 people in your area who may be interested in the advertiser’s product or service. Advertisers will not pay $1.50 per ad watched for sending their ads to tens of thousands of people who do not even have a need or desire for their products or services. They may as well trow their money down the toilet. 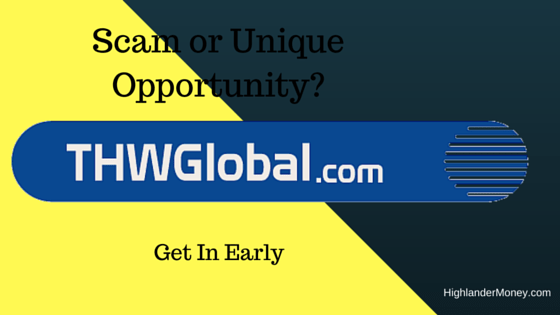 THWGlobal is target marketing advertising company. If we have a thousand people in an area who love pizza we can sell every pizza shop an ad to offer those thousand people a pizza that they make. If we had 1000 people who love to travel or take a cruise we can sell many ads to advertise to those people. But those are the small ideas. We at THWGlobal will have thousands of those type of clients but many of the big clients need to see that we have a 100 thousand people who like pizza or travel. Of course we are using pizza and travel as an example. HOWEVER just in the USA, pizza companies like Pizza Hut, Domino’s Pizza and others have spent over a BILLION DOLLARS going after the 50 Billion Dollar pizza industry just in the USA. Yes THWGlobal would like 5% of the pizza advertising business. We believe we are only a few months from this happening if you as part of the team leadership who have already built a small, medium or large team will do your part to continue to build, build and build. You + the 30,000 others sign up just 1 person a day this would be over 1 million new sets of eyes and ears we can sell to our advertisers. So for right now do not concern yourself with the 29,999 others just look in the mirror and say if THWGlobal is going to become one of the biggest advertising giants in the world it is up to me. I must fine someone new this day, this hour or even this minute. It is not the dozen generals or a great leader who wins a war. It is the thousands of Sargents who say FOLLOW ME… you need to start letting your team know to FOLLOW YOU and LEAD THEM TO SUCCESS! Analiza, thanks for the update. Where did you get this information from and are you part of THWGlobal? You are shedding new light on this company, I just want to know where this information is coming from, as I am unable to find any updated information on their site. Very interesting info. Sounds too good to be true? But if there’s really a way of earning up to $25 per hour just my watching and commenting on videos, I don’t see why not giving a try. If it’s free to join, just be aware of any potential upsell or anything that sounds like a scam. I’m curious is there anyone who could testify of making any money out of this? It definitely sounds, to good to be true, but you never know, I guess. The website has yet to launch, where you are able to earn money from, they are waiting to get more people to sign up and take the short survey before they launch. Hope this helps. Thanks Kenny! Thank you for a very interesting article on this opportunity, like you I am not sure weather this is for real or just another internet scam as well. I will admit it sounds way too easy to earn money online through this opportunity, I suppose the only way anyone will know for sure is give it a try. Your welcome, it’s hard to tell especially when they really haven’t even launched their site yet. If you do give a try make sure to stay guarded and protect your personal information. I’m not naturally a cynical person but with this THW my immediate reaction is ‘Yeah Right!’ Another smelly scam! But, I read further and I think more calmly. OK maybe there are some teenagers who want to be paid to watch videos. I’ve got better things to do with my time. Is there a sign on deposit? Is there an upline and a down line? Is there a 2 x 10 matrix? Yes there is. What does that mean? MLM. …no real product, just people piling up on people until the pyramid collapses. Ooh! Maybe I am a naturally cynical person.! Janelle, thanks for your honestly on this undecided legit company. It definitively seems to have the characteristics of not smelly right, but to be completely fair, it is unknown. The best I can do is share my opinion on THWGlobal. I strongly support people action on their initial gut feelings and caution, acting against their own feelings. Glad to help. Another point: the company his registered and run from Russia… they have no press officer or marketing manager we can make contact with to understand the company’s background. Please proceed with caution. I say let’s wait and see. The site is not running at 100% right now. They basically had a beta launch, where they tested the video platform and wanted people to use it, but without any sort of payment, yet. There are aspects of THWGlobal that are points for concern, as it is an untested company and new to the scene, and what you pointed out hasn’t put butter in the spinach. I agree with you, the jury is still out on this company. Russia is know for some scam websites and along with this they have no press officer or marketing manager that we know of. Your advice is good, as you are providing just your name and email address of right now and shouldn’t provide any harm. This is the point of my site to inform people. This is all I have of right now. Thanks. Hey Kitty, it could be just simply using a different browser. I was using Firefox and switch to Google Chrome and the videos appeared for me, as I couldn’t see the video either. So, try switching to Google Chrome and see what happens. I know somewhere on their they recommended that THWGlobal works best with Chrome but can’t remember where it said this. I see how you would form an opinion after taking the Demographic Survey, but try a different browser and see if that works. Please let me know if this fixes it for you and I will share with other people. Thanks for letting me know this! Glad to know that safari is working. Thanks for the information, Tito. Jade, if you are unable to watch videos there might be a couple of reasons why. First, sign up here to become a IV at THWGlobal, if you are already a IV proceed to the next step. Third, I don’t know what country you are from as your email is extremely short. Some countries don’t have enough people sign up for that region and as soon as there is enough people sign up video is available to that country. This is all I got. I hope this helps you. If not reply with more information and I will try and help. Have THWGlobal.com started paying to US people who have watched it there after launch? Kamal, no THWGlobal hasn’t started paying people in the US for any video watching yet…But in a recent email from them, they state IVs could start earning credits within weeks. At the same time there will be online certification for IVs to sell ads, I assume you make a percent of the ads sold or something. This is not required but optional. Hope this helps. THW Global is an internet Fraud and the owner is non other than Sherm Mason ( a big time scammer). There is no way to delete your account so go and delete your cookies & caches NOW! I deleted mine since the beginning of time. I have heard this many times, that Sherm Mason, a known scammer, is owner of this business. I have yet to confirm this. I do not understand much of global. Get conflicting information. You can currently watch videos for ten hours and then if they start to go. In the inbox on the site it says that they officially start on september 21. After that I got private a mail that they start on 9 september rather vague so. But if I would sit to 10-hour I would so can stop watching videos until they officially start? In fact, I occasionally comment on videos which is also nowhere noted word in my video statistics. Have more people here suffer from? If you go to your back office account and click on Video Viewing Stats left side of the screen. Then Viewing History under that, you cans see a graph with all the videos you watched and the last column you can see comments added. Hope this helps Ann. Hi Then thank you so much for your quick response. I kik id in the statistics list where you can view the length time ed so you see there as well or your advertisements have viewed all neatly listed but the comment’s I’ve featured on videos. So if I understand correctly then you do not longer than 10 hours watching videos and once they start start with the five hours or more per week look? From what I read you must watch a minimum of 5 hours of activity to qualify for commissions on those seven days. I’ll post part of the message I got from THWGlobal, maybe this will clear it up for you. Remember you do not need to buy anything. But at the same time we are an Advertising Revenue Opportunity. Did you know in order to earn personal and TEAM EARNINGS meaning your customer referrals in your TEN LEVEL TEAM. There is a minimum qualification of 5 hours weekly spending time either watching videos and more importantly supporting and reviewing all the advertisers who are paying to advertise in our back office and all around the video ads. Basically the system is always looking back to see if in the last 7 days if you have at least a minimum 5 hours of activity (waived for Certified IVs). Failure to do so forfeits your commissions for those 7 days only. Again this was not important during beta stage but is important going forward. Of course many of you are watching and surfing our back office ads a lot more than 5 hours weekly. Most will go for the maximum 10 hours weekly and more. When you are surfing in the back office please be fair to our advertisers by really looking, reviewing and reading what they are offering. Review and study as many advertising offers as possible. a) this helps THWGlobal sell more in house advertising and b) our in-house advertisers will be happy and renew there agreements with us. There is so much tracking these days they know what you looked at and for how long. No problem Ann, I am glad I can help you and also maybe someone else too, that needs clarification. Thanks for the well wishes too. I sent them an email asking about the certificate for IV’s, though they said you are not obligated to buy it they were very condescending and they got upset because I mention that I was skeptical if it was a scam. After that I was not able to watch the movies. It keeps bringing an error, so I thought they had blocked me, I still don’t know if they did. Robbi, They should understand your concerns being they advertise making up to $25.00 a hour, and the internet is full of scams. Also they are a new company with no reputation and should expect that. login problem has now been solved I come in again. Robbi I sincerely hope for you that it is also a failure. I understand your fear completely think many have these feelings because they have so often been scammed on the internet. I think if they are an honest company (no man who knows that, to date, let us hope so) then they will have to have understanding that you have expressed. I have been following thwglobal almost since the begining. I am unemployed, wages are very low, so I signed up. When I sent my referal to people I know, nobody followed, only one ex-collegue answered with one word timewaste. Now I am really happy that I have read some very interesting comments here. I personally think the thwglobal is very suspicious. By the way I live in Russia and thwglobal is growing rapidly here. There is no navigator to get fresh fruit from the south to the north. So I don’t want to buy something from the US, shipment cost can be hire than the price of the product. I don’t understand. They also set up thwglobal group for russian speakers on facebook. I wonder if there is one for other language speakers. The above video is in Russian. So the man is giving an evidence. Here is the evidence. He is talking about a man who is actively promoting thwglobal in russian net. He is showing a video of this guy from 2012, when the guy was promoting “the global1”, which doesn;t exist anymore and nobody made any money out of that. I don’t really know why they are pushing it. Well I wish that video was in English as I can’t understand a thing. So, I am unable to form a opinion about it. Sorry, but maybe other Russians can form an opinion about it. Thanks anyways. Hey Ikrom, sorry to hear about your unemployment. It’s hard when jobs are unavailable and even worse when wages are low. I know why some many people are interested in it, it is because of the possibilities of making a living online. Because sometimes jobs are hard to find locally and earning a decent wage is appealing to most. THWGlobal is very suspicious, they promote making $25.00 an hour which is unheard of for watching videos in the online world. It very well could be a time-waster. It is unknown which way this company will go. If you are unable to convince any of your friends you might want to recruit through other methods. Create a video on YouTube reviewing THWGlobal with a link to join below. Build a website with a review about THWGlobal. If you need a free website you can click here to get 2 free website right nowThere are options out there just try to think outside the box. Hope this helps. they paid to any member? have any prof? if any brother got payment from this site please notice us. thanks. They haven’t paid but there not completely up and running yet. They are supposed to be fully up and running Sept.21. I will definitely post if they pay on this page or my other page >What Is THWGlobal? So check back as I will update as soon as I know. Hey Boughalem, where are you viewing this counter at? Is it in the backoffice of THWGlobal under Viewing History? I noticed from my own personal watching of videos, If you watch a particular video numerous times you won’t receive credit for watching that video multiple times. As I had found numerous long videos to help me reach my 10 hours minimum. Like for example their is a video title roundabout that is 18 minutes long. I noticed I stopped receiving credit for watching it in the backoffice yesterday, but before that I receive credit for watching. This is the only email I have for THWGlobal. I am afraid this is all I have on this to help you. Thanks for the information, Sterling. I have heard this myself but unable to confirm this. If anybody has the information would please share with me or point me in the right direction, I will be sure to post it here for everybody to see. Hey Aashir, I just checked my backoffice and all of my hours are now showing. Yesterday, I was experiencing the same thing as you mentioned. I too was worried for everybody that their hours would be wiped clean. I think they were just in the process of updating the site. Maybe, they are just updating the Pakistan site statistics now. Just to be clear, Thwglobal is not paying yet, but hopefully should be up in running later this week. Hope this helps. Yeah, hopefully people can make money here, it’s great to be positive just don’t forget to protect yourself. Thanks for the comment and thoughts Ann! Thanks Ann, I am glad I am able to help and reply, hopefully with useful information. THWGlobal is back up. Thanks! Thanks for sharing this email, Ann. I updated the information above and was an oversight on my part. I think part of what you wrote is confusing as I know your from the Netherlands and is probably translated wrong and is not your fault. But I think your talking about the site being down. Yes, it is very annoying. I would suggest you try at a different time also, to see if it works better for you then. As I think you are trying to view videos when THWGlobal is updating their system. Hang in there, I think it will be resolved in the near future. Glad your issue was resolved. Yeah, maybe your email did the trick. From what I understand yes, to your question Ann. I posted the message that was sent out on the 09/23/2016 at What is THWGlobal? For people to start reading. This shares a lot of the information of what is going on. I am going to have to read this a couple of times my self to fully understand it. Hi, I signed up for THWGlobal yesterday but got no activation link or anything. My name shows up on my referral link, which opens up to my page of thwglobal. Fortunately, I had copied one referral link … but, after that I am unable to login … i ask them to send me my password reset link but although they say it has been sent, I have been unable to receive it 10 times over. And to cap it all there is no support email to write to. What do i do now Dan? Hi Ritu, As far as I know they do not send out an activation link. Once you sign up your signed up. No need to activate, I think…not 100% on this. If someone else reading this know please share the information. I posted the two IV Login sites links below. If you are in the video page there should be a backoffice button to click on towards the top to login in there too.They both have, forgot you username/password? Which I am sure you have already tried. I clicked on your thwglobal referral website and it comes up with your user name so that’s working. Maybe your email is blocking them, I don’t know. Check all of your Gmail Boxes(assuming your using gmail), like I have three Primary, Social and Promotions, these are located at the top. Also, maybe you misspelled your password or email address the first time. So they might have the wrong email address. Another option would be to use a different email, if you have one, and create another account. If you do than please sign up under me here. Hi all o it is quiet here all busy with watching videos? I manage at all a bit? I have to honestly say if I required that 10 hours should have done that would have been a human being has the best heavy well once more to do. I manage at you a bit then? You know works yet also according to me? Anyone have any idea how the cash out goes “it is very quiet with e-mails on their part but maybe someone knows more? It is pretty quiet but hopefully something is going on behind the scene. I am not getting my 10 hours in as I am really busy with a lot of things. I did want to notify everybody that reads this site, that I did send in $30.00 money order for the eLEarnign or the power leg. Not quite sure what opportunity this might be but I decided to check it out and try. So far my account hasn’t been credited with the $30.00 yet, but I only sent it out last week. I will determine over time if it is worth it and will write about it above to let everyone know if it is worth it. Just wondering if anybody else has sent in money? Hee then do you know what they mean that you’re qualified? I have some hours now videos looked and there is now with me at the top-right of qualified. No idea what that content is only valid this week I believe next week you are no longer qualified as you have looked again so many hours. Are you talking about the Weekly Summary under the Video Viewing Stats? I believe you are talking about this. The Current Week Qualification Status: Not Qualified/ is where I assume you must get at least 5 hours for the week and a maximum of 10 hours to qualify to earn credits If you fail to reach 5 hours, I believe you don’t earn any credits for that week. As credit are dished out weekly. I have also noticed under Video Viewing Stats under Viewing History they have a filter that shows you Earns Tokens/ and Does Not Earn Tokens. I’ve noticed if you don’t watch video to completion it shows up under Does not Earn Tokens for the most part, but even some videos watched to completion show up under here as well. I don’t know the requirements of what is credited and not credited to you. Hi then can you tell me what the content if you are qualified? I now have a number of uut videos viewed and now it says that I am gewalificeerd when I started was that not so apparently if you looked a certain time have you become qualified but what does that mean? do you know that? Try to get at least 5 hours (10 hours maximum) under Qualification Status. You can check this to see if you are at the minimum for the week before the week is over. Otherwise all that viewing is going to be wasted. It gives you the start date as well as the end date for that week. This can be found in the Backoffice under Video Viewing Stats, then under Weekly Summary. It’s kind of confusing they have Tokens and Credits Earned. I haven’t figured out the difference yet. Yes exactly that I referred to. AHA works so I start finally a little to understand thank you so much for the clear explanation. Glad to help you. It becomes clearer to me to when I explain it. I just came across your site. Thanks for doing this. I joined THW Global in August as I am unemployed as well and was hoping to make some money. This is the most bizarre company/launch I have ever seen. You cannot contact the company with questions, they keep changing their dates of various things, when you send money to them for elearning or certification, it HAS to be a money order or cashier’s check (NO way of tracking it or proof of payment) and is sent to a virtual office. http://www.thwleadership.com/ and the email thwQandA@thwleadership.com are NOT the company. It’s a group of certified IV’s that seem to speak on behalf of the company. I have sent them questions. Some get answered, some don’t. I truly did not want this to be a scam but as time goes on, it looks more and more like it very well may be. The last time I spoke to someone by email, they stated something about making 1/10 with outside advertising as opposed to inside advertising. They also stated we would make $5 a WEEK! When I questioned this, they back peddled and stated “Oh, that’s just an example”. I am not going to view 10 hours of video a week that takes me 30 hours to watch and only half of them get credited because some do not earn tokens for a pay of $5 LOL I can make that in an hour of doing surveys! Hey Shannon, No problem, I like trying to help people. It is kinda sketchy in ways, I often think they are just a new company trying to work everything out but sometimes I also think it seems pretty scammy. You hit it right on the head bizarre. I had sent $30.00 in to the elearning and to be eligible for the Power Leg as well. They have credited me my 30 bucks, so they at least acknowledge my money got to them. The elearning is kinda weird too they have set of lengthy detailed instructions for using Microsoft Word 2007, 2010, and 2013. I already know how to use Microsoft Word so I guess my money is strictly for the power leg, which is supposed to be up and running at the end of this month. Fingers crossed. Having certified IV speak for the company is sending my spidey senses in to overdrive. This is not a way to run a legit business and never will be. The company should be more transparent. If it turns out to be $5.00 a week it will be disappointing to many people, and a far cry from their stated $25.00/hr. On another note, THWGlobal videos seems to slow my computer down, it either bad coding or they are updating when I am watching. I usually have many browser tabs open as I multitask and I find if I close the tab that’s playing THWGlobal videos my computer goes back to normal speed. This is frustrating as well as not being credited for videos watched. I have also notice if you already watched a video and try to watch it again (like the longer video) they fall under Does Not Earn Tokens. So it is just wasting your time on some of these. Why videos do not earn tokens should be clearly explained somewhere, as well as the difference between credits and tokens, cause I’m lost. I also cannot use the share video anymore as it just appear blank now on this page. I really suggest you also look at my Wealthy Affiliate Review under My #1 Recommend tab above. They teach you how to build a website and to make money from it. This is how I learned and I am contiuning to learn as well. As well as my review on Dealspotr review, I have made $50.00 dollars in a little under a month with little effort. Sign up under me if you like the review. would you like to start your new week is not. What is this now? do you know that? view from your country is temporarily suspended while improvements to the system are in process, please check back later. I don’t know where you are seeing this but I don’t know what it is, but I did receive the message temporarily suspended while improvements to the system statement over the weekend but now it is gone. Hi Ann, It is working on my end maybe it’s just your country. Hopefully it will be up for you in a day or two. Thanks for sharing your information and possibly helping other people that might be experiencing the same problem. It is a frustrating time for THWGlobal users, system is buggy, it’s down a lot, not a lot of information and some things are left unexplained. Please share with many any site that you find and like, Ann. My site is reviews quite a few sites, my number 1 way to earn online is what I really recommend but it takes time, and that is Wealthy Affiliate. They teach you how to earn money online. I also really like Dealspotr. I also did a review on it, but I am not sure if it is available to internationally. Onespace and BlogMutt are also good. So interesting. Someday hope to look more into bitcoin as well. You just copy and paste one of the video name then enter it into the search area at THWGlobal. The thing about this is I think you are only credit once for each video, as I have tried to watch these videos more than once and I am not credited within the backoffice of THWGlobal, under the does not earn credit section. They used to have videos on the platform that were 1 hour long but since have taken down the longer videos. thank you so much i’ll try it. Hey maria, your work is recorded in Your Viewing history and supposedly payment will be made in the future. You can view it yourself in the THWGlobal backoffice to see how many token you have earned for that week. Now, when they plan on paying, is anyone’s guess, the date keeps getting pushed forward but I would assume it’s going to be soon (within a month or two). I tried to logon to the backoffice myself and it seems to be down again. thank you so much i really appreciated. i am from bangladesh and i try to go to the thwglobal webside but it’s not come out. i try sevrol time but it’s show me samething like this…. Just be patient they are updating their site, it should be up in a day or two. Hope this helps Siddika. I can not watch video either. There was a new captcha box that I had to click, that looked new, but after I click that I get Server Error. Wondering what is going on. I really don’t know what I should think. For more than a week no more videos can look at it is very strange. I find it weird that they pass by mail or anything like that. Video is now up for me at THWGlobal. It is strange… Video page is up for me but when I click on it I get the error message. If I am reading their email correctly from within the backoffice that was sent out on 10/26 is I think 11-24. I am not a 100% clear on this as their wording is weird. Check your messages in your backoffice to see the latest info from THWGlobal. Viewing from within your country has been temporarily suspended while improvements to the system are in process, please check back later.being like this now for over 4 weeks i live in Ireland but ive seen it also in many other countries .. how much longer ?> never …. Trever, I have noticed I haven’t been able to view videos either for a long while now. I don’t know what is going on and I have not received any updates within the backoffice, but I just checked here and there is some information. Check it out http://www.thwleadership.com/. It say go into a wait and see mode until the video is back. They also say they are not going anywhere. There is a lot to read. I guess this site is turning out to be a scam. The reason I say this is because I was in the program right since when they were 10k or something hours away from launch. Initially, I got to review ads (free) and got regular updates from them regarding their progress. Just recently since about a month or so, I have been seeing “http://www.thwglobal.com/VideoCenter/CountryBlocked” everytime I log in. However, this should not be the case since India is one of the top ten countries when it comes to IVs. Can you please look into this? To be completely honest with you, I am completely confused with all their systems and all of their different ways of making money. Now they are pumping coffee to sell. Yeah…okay?! I also find it hard to invest more time in learning this constantly changing platform that keeps never paying, or at least I can’t find the payment button. It is hard to get your head around this, it shouldn’t be this hard to understand something. Then to top it all off they don’t post information at the THWGlobal they just post it on the THW leaders website found here, http://www.thwleadership.com/. I’m reading the top of this page and my god, they have another system of making money. I might just have THWGlobal burn out. Or maybe I just get easily confused. What do you think? I am leaning more and more that this site is a scam. Is this devised to be this complicated? I think I sure am leaning this way. My best advice would be check out the thwleadership website. Try watching videos from you back office, I’ve notice I have to sign in my backoffice then click a video within there to be able to watch videos, otherwise If I click sign in I get an error message.